Apple’s September news conference — where it showed a new lineup of iPhones and the iPad Pro — was billed as an event targeted to consumers. But when one views the advanced feature sets of these new products, it’s not hard to miss significant implications both products may have for television news. Over the past five years, TV news has been changing fast. Already, Apple's iPhones are being used in news, based on the simple theory that hundreds of iPhones in the hands of consumers in the field is more likely to produce more compelling news footage than a limited number of staff photographers. At first, it was deemed OK to accept a little less quality to get more exciting news coverage. But now that quality difference has changed. The latest iPhones have far greater image processing power and can not only shoot and edit high-definition, but 4K resolution video at lower light levels. Apple has made great strides in image quality in only a year. On the air, viewers probably will not be able to see the difference between the new iPhone’s footage than that of a far more expensive and complex news camera. With the improvements we have seen annually, that quality difference is expected to decrease even more. Not only has Apple been working to close the quality gap. Third parties have been tackling every aspect of the iPhone. On the lens front, Ollioclip, Schneider Optics, Manfrotto, ALM Pro, Optrix, Digital King, Exolens, iZZi and Ztylus are among the companies developing a variety of wide angle to telephoto lenses for iPhone models. Lenses keep getting better as greater research and development goes into the device. 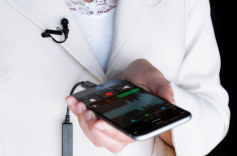 On the audio side, Rode, Shure and others have introduced lavalier and M/S microphones for the iPhone’s audio jack, while Sennheiser and Apogee have created very high-quality lavalier packages with analog-to-digital conversion that plugs into the iPhone’s digital input jack. These microphones far exceed traditional broadcast quality and can be used for on-air narration and on-camera standups. A new iPhone feature called Live Photos brings even still images to life by capturing a moment in motion. 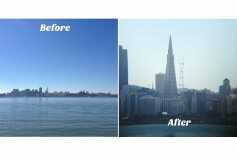 These 12-megapixel photos (up from eight megapixels of previous models) reveal the moments immediately before and after the shot was taken, giving it a short clip of video. The iPhone technology is powered by the Apple-designed 64-bit A9 chip (the most advanced chip ever in a smartphone) and much faster LTE and Wi-Fi operation. 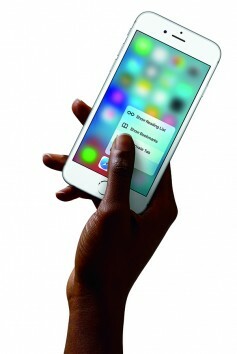 With the advanced wireless technologies, iPhone users can browse, download and stream content faster than ever before. The new iPhones also support up to 23 LTE bands. High-definition video improves with support for 4K. Current models have a resolution of 3840 x 2160, delivering over eight million pixels. Expansion of optical image stabilization to video on iPhone 6s Plus allows taking improved videos in lower light. After capturing HD or 4K video, users can still edit on any Mac or PC. But with the latest version of iMovie on the iPhone or iPad Pro, two simultaneous 4K streams can be edited. The iPad Pro could very easily end up replacing laptops in field editing operations for TV news. Though very thin and light, it features a 12.9-inch Retina display with 5.6 million pixels, the most ever in an iOS device, and superior performance with the new 64-bit A9X chip, rivaling most portable PCs in use today. It also has a 10 hour battery life. With the new Apple Pencil, also announced, the new iPad Pro also becomes a professional quality graphics creative device that can be used on location. From courtroom sketches to art that can be used with on-air stories, the iPad Pro can be used in the field to produce professional quality illustrations and other visual aides. The pencil, which works at a single pixel level, makes drawing and sketching feel remarkably fluid and natural. Then, perhaps most important of all, is the lower cost. The new iPhone cost exactly the same as the old models. The iPad Pro starts at $799 for the 32GB with Wi-Fi model and $1079 for the Wi-Fi + Cellular 128GB model. On both the shooting and editing front, the cost of the gear is much lower than today’s field production tools. It’s hard to say with all the technology advancement when the Apple iOS ecosystem will become irresistible for television news. There are clearly still gaps in the technology that need to be addressed. But there’s no question Apple and its partners are closing the gap and it’s happening fast.